It was a mother and daughter day on November 7th. 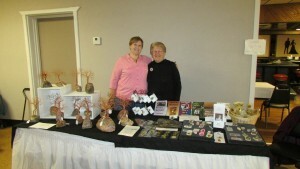 First, Rebecca and I spent the day at the Starlite Club, Kaukauna, selling books and crafts. It was a time when many column readers stopped by to visit….and buy books, pressed flower bookmarks and watercolor pins. Rebecca’s wonderful copper trees were a big hit. It was a very nice event. The quilts on display were amazing. That evening Andy, Rebecca’s husband, joined us at the FMPL Wine and Bear tasting at Doxbee’s, Seymour. I came home tired, but happy.